I walked outside the hotel to catch the fiery, red-hot, sunset over Villahermosa in the state of Tabasco, Mexico. 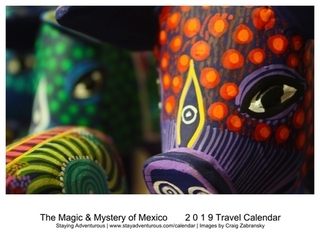 My Mexican adventure began here and then I bused into Chiapas and attend the ATMEX (Adventure Travel MEXico) conference in Palenque. After my trip, I took an extra day to discover more of Chiapas visiting the Mayan Ruins of Palenque and the cascading waterfalls at Roberto Barrios. 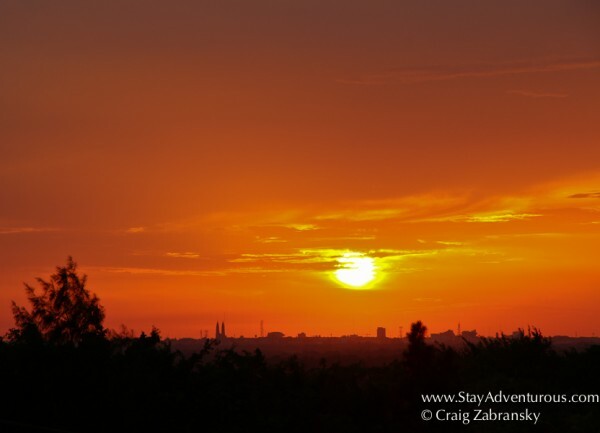 After nearly a week adventure in Chiapas, I noticed I didn’t have one sunset moment. 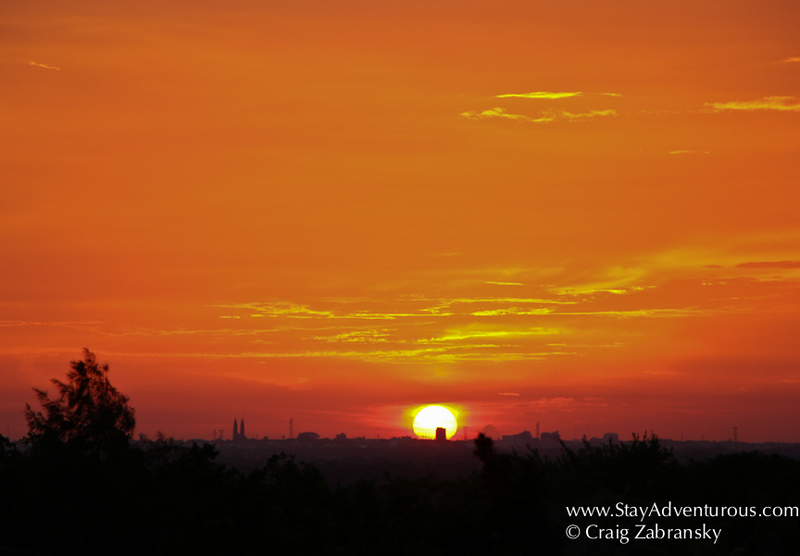 Then just before my early flight back to the states, I spent an evening at the airport Hilton in Villahermosa. I took the evening off from touring (although I wanted to explore Villahermosa and discover more about Tabasco) and decided to relax and catch-up on after pressing matter after the jungles of Chiapas and the fiesta of networking at ATMEX.I needed to unwind and just relax. I also wanted to capture a sunset. Fortunately, I did. I purchased a Tecate (can of course) from the local hotel convenience store and then walked outside to wait, watch, and wonder. 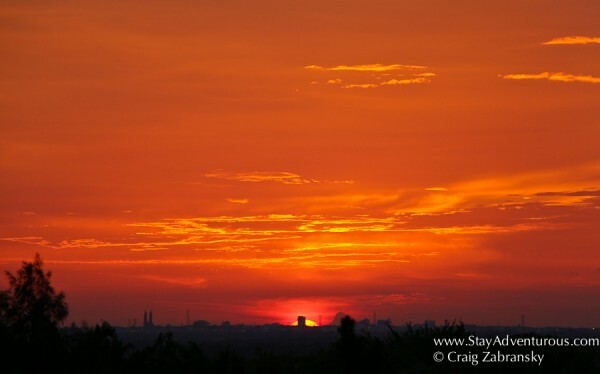 The sun, a brilliant ball of fire, gave me the Mexican sunset moment I craved (and missed in Chiapas). It became the perfect chance to recharge before heading home. Tabasco (the state, not the sauce) is famous for the giant sized Olmec heads carved of stone. 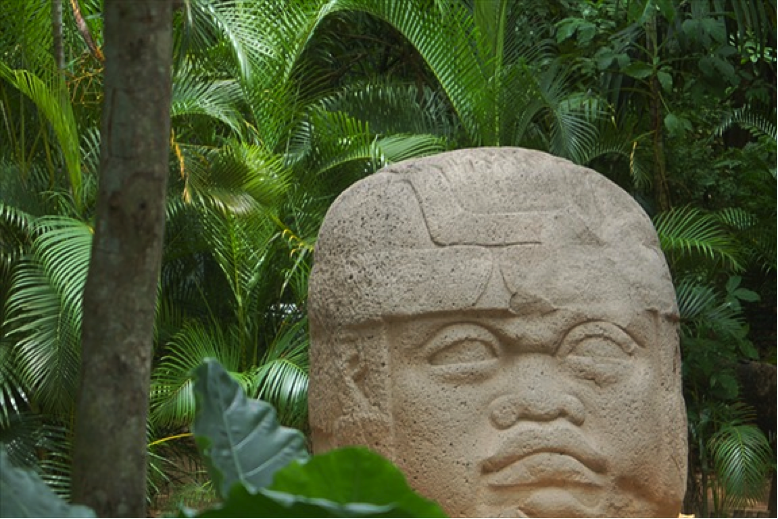 In La Venta museum park in Villahermosa, one can visit see one of these giant Olmec heads and many other Olmec artifacts. This area, now known as the Emerald of the Southeast, was once home this ancient civilization. this is part of the #MexMarchMadness for 2016; enjoy all the Madness at Mexican March Madness.